Additionally, five artist’s broke their records at the auction. 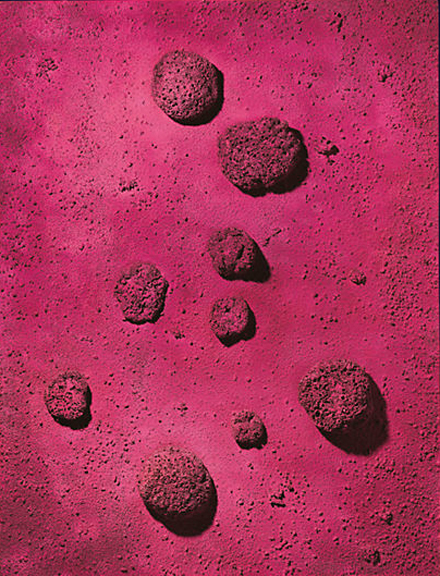 Leading the pack as the undeniable highlight of the evening was Yves Klein’s Le Rose du bleu – boosting £23.5 million. The estimate had been available upon request, and according to Christie’s was hoped to earn in the region of £17 to 20 million. This sale set a new world record for a French post-war artist at auction, and reestablished the artist’s record at auction, which had just been broke this past May in New York at Christie’s. Another Klein among the top lots was Rélief éponge bleu (RE 51), which sold for £7.6 million – within it’s estimate of £6 – 9 million. 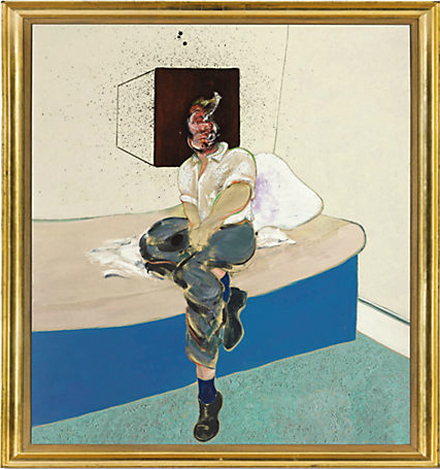 The second highest price tag of the night belonged to Francis Bacon‘s Study For Self-Portrait. Also equipped with the elusive ‘estimate on request’ – it had been expected to garner between £15 to £20 million – it sold for £21.5 million. Three bidders raced in a slow, determined match for this mash-up of Bacon and Freud. This is in the wake of its failure to sell in a 2008 auction, and after being the subject of a much publicized lawsuit. The third major highlight, as well as a record achievement for the artist at auction, was Jean-Michel Basquiat‘s Untitled. The third and final bearer of the ‘estimate on request’ tag, it earned £12.9 – against it’s anticipated £10 – 15 million. 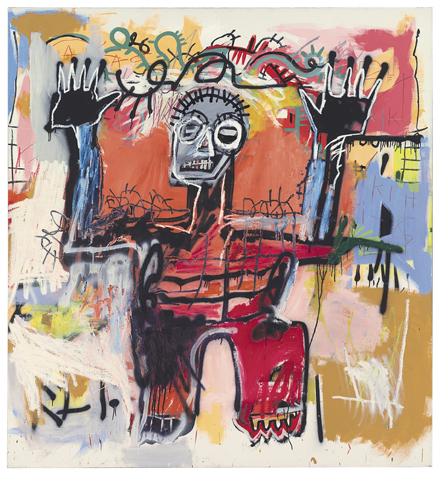 This shattered the record set at Phillips de Pury this past May for a Basquiat at auction, also turning a profit since its last appearance on the market at Sotheby’s in 2007. 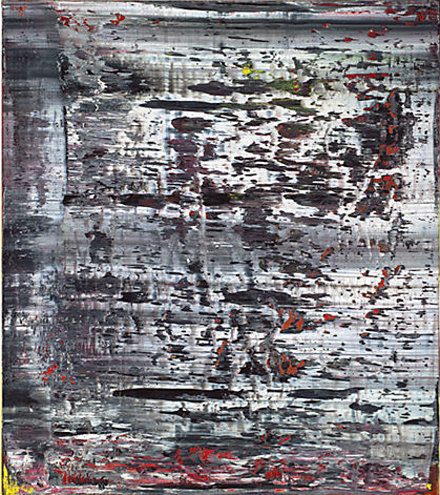 Following close behind, as the fourth highest grossing lot, was Gerhard Richter‘s Struktur (2) – which realised £12.6 million against its expectations of £9 – 12 million. Additional highlights include record breaking prices for three other artists. Led by Beatriz Milhazes‘ O Elefante Azul (The Blue Elephant) at £937,250 – over double the expected low of £400,000. Marcel Broodthaers‘ Surface de moules (avec sac) (Surface of mussels (with bag)) achieved £433,250 – nearly double the high estimate of £220,000. A record breaking sale at the fourth lot of the evening -an auspicious sign. Lastly, David Altmejd‘s The New North brought in £217,250 – within its estimated £200,000 – 300,000, yet still setting a record for the artist. A surprising lot was Mark Grotjahn‘s Untitled Butterfly selling for £836,450 – almost three times its high estimate of £300,000. This optical painting spurred fierce bidding, and was deemed a “steady march,” by Christie’s auctioneer. Though not everything sold – works by Christopher Wool, Barnaby Furnas, and Anish Kapoor were all passed over – the sale proved a reliable litmus test in exhibiting the strength of the international contemporary art collecting community. This entry was posted on Thursday, June 28th, 2012 at 11:41 am	and is filed under Art News, Auction Results. You can follow any responses to this entry through the RSS 2.0 feed. You can leave a response, or trackback from your own site.